LA Unified met today’s deadline and filed an application for a No Child Left Behind waiver without one of the key requirements of the U.S. Department of Education — an agreement with the teachers union on a three-level teacher evaluation system. If approved, the California Office to Reform Education (CORE) Waiver would clear the way for LA Unified to receive $171 million in federal funding. While the absence of agreement with the union, UTLA, does not automatically disqualify the district or make it ineligible for federal dollars, Rick Miller, Executive Director of CORE, suggested today that the district’s incomplete proposal could jeopardize the district’s application. “Non-compliance with this commitment, or any other commitment made in the School Quality Improvement plan, puts approval of the Waiver at risk,” he said in a statement. In fact, Washington will not make final decisions on waivers for several more months, leaving open the possibility that LA Unified and UTLA could reach agreement within that time frame. Teacher evaluations have been part of the current contract negotiations between the district and the union, which are now in the hands of a federal mediator who is not scheduled to meet with the sides again until April 6 and April 15. 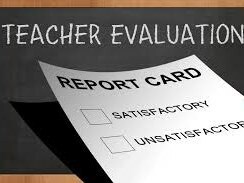 UTLA argues that a three-level evaluation system, one that would distinguish a “highly effective” teacher from those who merely meet standards or are below standard, paves the way for merit pay. The union is fighting to keep a two-level system in place. Cortines offered to fly to Washington D.C. with the president of the teachers union, Alex Caputo-Pearl, to discuss the matter with Duncan in person. It is unclear if Duncan responded to Cortines’ request. But LA Unified is not unique in failing to meet the administration’s waiver requirements. Georgia’s State Superintendent is asking the feds for an extension to review the application while the state decides on the length of its renewal request. Idaho is also seeking an extension. And it’s possible Louisiana will ask for a delay as the state’s legislative session conflicts with the waiver renewal timeline. Closer to home, Santa Ana Unified skirted around the teacher evaluation issue by implementing a three-level system at a single pilot school, according to Deidra Powell, chief communications officer for the southern California district. “We’re on board for trying it but it’s much easier to see if it works in one school than applying it all over the district,” she told LA School Report. “This lets us comply with everything and get our application in on time,” she said.